When my husband and I go out for dinner, we tend to eat at the same chain restaurants over and over again. But when we find a special restaurant to eat at that has great customer service and works with us, it’s like finding a hidden gem! The restaurant, Bella Trattoria at the Mission Inn in Riverside is one of those gems. A couple of weeks ago we visited Bella Trattoria for the first time, celebrating my grandparents 50th wedding anniversary with friends and family. My aunt and dad were planning the anniversary party for my grandparents, and were given the go-ahead that my brother and I would be able to eat there. Now, if you deal with food allergies and trying to eat out, you know that often talking with one person, and then another, you will get conflicting stories or information regarding the safety of the restaurant. So, as I often do, I ate beforehand and braced myself for the possibility of not being able to eat there. Upon arrival, I met with Dalane, who was extremely helpful, friendly, and accommodating. He shared that peanuts were not in the facility at all, and that they could also accommodate with dairy-free menu items. 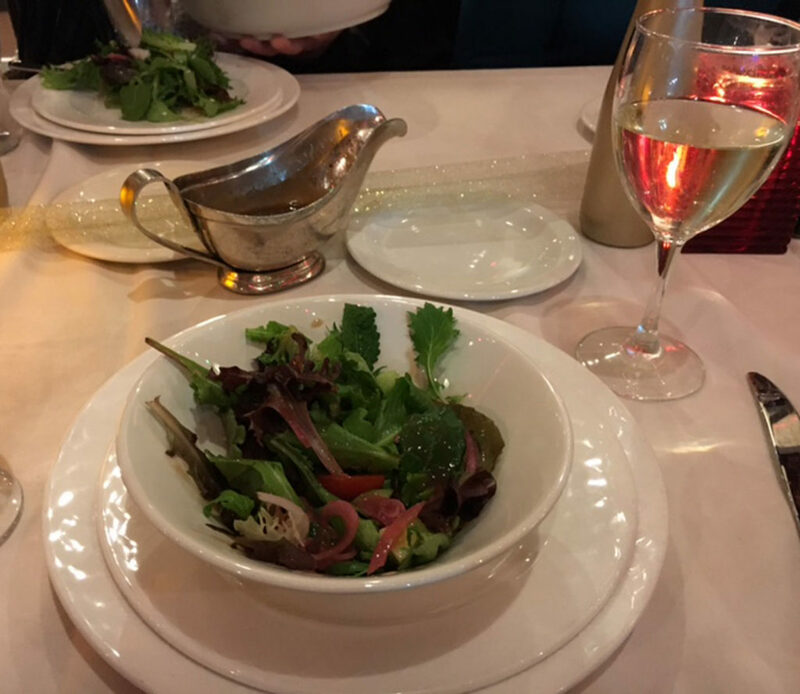 Although I could not eat the breadsticks (the cheese was on the bread before it was even baked), they were able to alter the salad to not include dairy. The salad was delicious! Because we had such a large party, they served meals family style, and I was able to eat two of the three different entrees. 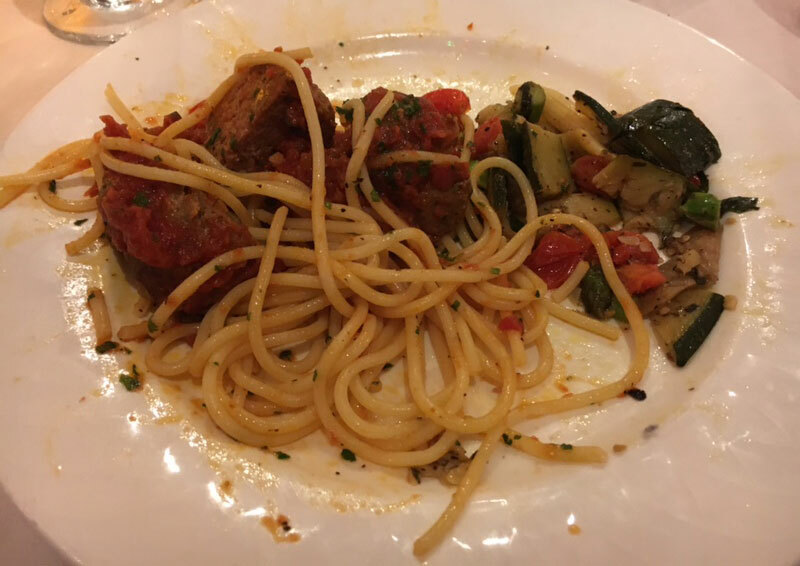 I was able to eat the spaghetti and meatballs, as well as the pasta primavera – both were delicious. (I was so hungry, and the pasta was so delicious, I forgot to take a picture before I started eating)! Having multiple, severe food allergies, it is rare to be able to enjoy big parties and events with family and friends…and also be able to eat with everyone. It seems so simple, but it really is so nice to be able to enjoy a meal with friends and family, and leave with a full tummy! I want to thank Bella Trattoria (and Dalane) at the Mission Inn for letting me enjoy this celebration! If you do get a chance to visit Bella Trattoria, Christmas time is completely magical there. 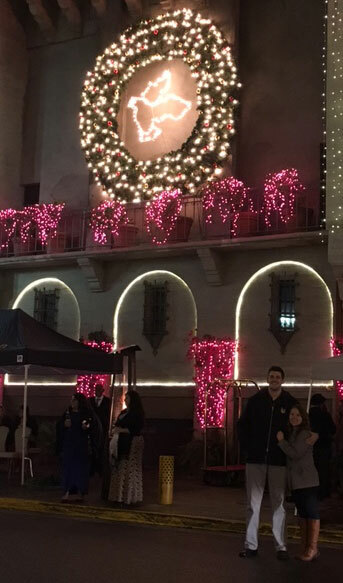 (This is just the side of the building, but I still had my little brother take a picture of Nolan and I because I love Christmas lights)!